The ongoing WarmaShock project has been progressing nicely! It's been a couple of weeks since the last update, but that's because I've been working on the unit of splicers and the Big Daddies - I've got some fantastic miniatures finished for both, but I'm waiting until all splicers/BD's are finished in order to upload them as a whole. In between splicers, however, I have been working on a few other bits and pieces here and there, so that I don't become bored or resentful towards the unit and stop giving it my best, and that leads me onto this update. So far, this army has seen Booker DeWitt and Elizabeth Comstock from BioShock Infinite, and Eleanor Lamb from BioShock 2, so I thought it was time to revisit Rapture and add something quick and easy to the list. Characters are incredibly satisfying to piece together - especially when you feel very passionately about them - but they don't often embody the world around them. That's what I wanted to start doing; converting miniatures which felt like they held the very life and soul of Rapture and Columbia. 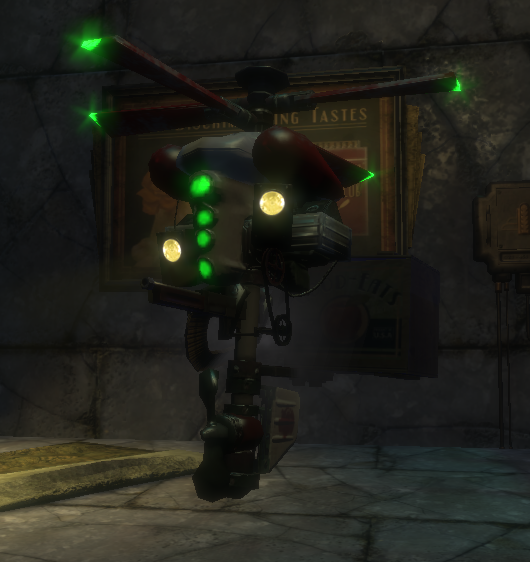 With the Big Daddies still being worked on there was one other thing which I felt was integral to feel of the first two BioShock games: security bots! I've always had a soft spot for these guys (or at least since the first time I was able to get them to fight on my side). In the first two games it felt like you could barely turn a corner in Rapture without walking past a security camera and sending a pair of security bots buzzing after you, so I really wanted to have a couple featuring in my army. The main problem with the bots is that they are a unique shape. While working on Elizabeth did give me some practice with green stuff, I still wasn't in a position where I would confidently and competently start sculpting something along these lines. So when I started on these bots, I decided that I'd be happy to settle for a miniature which captured the overall feel of them, rather than a perfect, authentic replica. The first thing I had to do was to find a model to use at its core. Seeing as the security bot is basically just a machine gun and a camera attached to some rotor blades, the logical place was to start scouring my bits boxes for discarded weapons to work around. Sometimes, though, logic gives way to good fortune, and a trip to my FLGS prevented me from having to start digging! 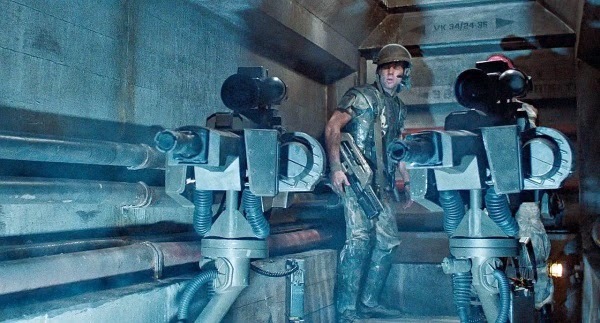 ...the colonial marines sentry turrets from Aliens! They may be the wrong shape for the security bots, but as far as capturing the overall feel goes, they seemed like as good a candidate as I was going to get. And to make things even better, it turned out they were giving out free samples of the sentry turrets and alien facehuggers, so I ended up getting a pair of turrets at no charge and before the release date! It certainly felt like a day of hobby win. The turret miniatures themselves are of fantastic quality. Now I have to say that I'm not the biggest fan of Prodos (to put it mildly) for reasons I won't bother going into here, but the entire AvP range is absolutely stunning. Seeing as I was building bots and not turrets the majority of the stand would be discarded, but there were some parts on it that proved useful. The turret itself has a very nice overall aesthetic so I kept it in one piece, but it did need a couple of additions. First of all I wanted to bulk the turrets out a little bit, as they are quite slim. The stand does include a large box which I assume is supposed to be the power unit for the turret, so I clipped this off the stand, filed down the excess, and attached it to the side of the gun. Now the eagle-eyed amongst you may have noticed that the turret is upside-down in this photo, and that's the way it's going to stay for the rest of the build. First of all the indentation for attaching it to the stand is perfect for the rotor assembly, and secondly the light which was previously on top of the turret looks great hanging beneath the barrel of the bot. Next it was time for the rotor blades. I have to admit I have no idea what these riveted strips are from, but I picked them up whilst rummaging through Titan's bits box a few days beforehand. I didn't know at the time what I'd be using them for, but they felt like they'd come in handy on the WarmaShock build as a whole! Take this as a lesson, kids, buying online might seem great, but never underestimate the benefits of having a good relationship with your FLGS! If I was feeling impatient I could have left it there, but something about the bot didn't feel quite right. I soon realised that it wasn't quite tall enough, as the Rapture security bots do seem to have quite a bit of height to them as they come hovering towards you in the game, so I needed to find some way to extend it downwards slightly. Back to the stand! The tripod had lost one of its legs when I removed it for the power pack. The remaining skinny leg looked like it might work to add a bit of volume to the bot, so I clipped it off, tried a dry-fit to the model, and it actually did the job pretty well. One dab of superglue later, and the first security bot was built! You might have noticed that I've put these on 40mm bases, instead of 30mm. It might seem odd, but if you'll bear with me there's method to the madness! 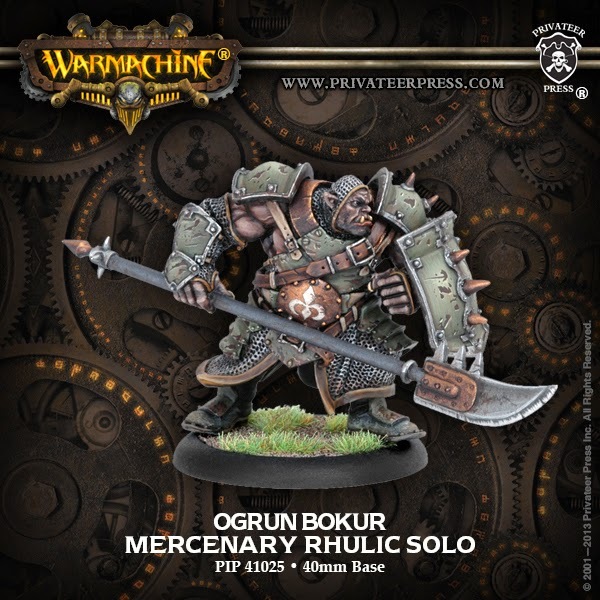 I wanted the miniatures to have the feel of the BioShock security bots, so trawled through the Warmachine Mercenary units to see where they would fit in the best, and as daft as it sounds the Ogrun Bokur was the best! Granted he has no ranged weapons, but the Bokur acts as a bodyguard to a warcaster or solo in the army, so this allowed me to have one bot guarding the main warcaster, whilst the other protects the journeyman warcaster. They're solos, so they can happily whizz around the battlefield doing their own thing. And finally - and I found this a nice touch - they're FA2, meaning that the army can only contain two of them. If you've played BioShock 1 or 2 you'll know that your character can never control more than two security bots at once, so even this is fitting. So that's the latest addition to the army! As I said earlier, the Big Daddies are under construction (2 completed, 3 to go), as are the splicers (4 down, 6 to go), and the first Little Sister is also done, so hopefully the next update should be fairly soon! As always, I hope you enjoyed this article, and I hope to see you again for the next addition to the force!